Compare prices on car hire in Rome Ciampino Airport from all the major brands and find the best deals. When you book through us, unlimited mileage and insurance are always included in the price given. Rome Ciampino Airport is located 15 km southeast of Rome and is one of Rome’s two airports.Buses are a great way to get between the airport and Rome on the buses is well connected by rail and underground network in Rome.It is a good choice of car rental companies at the airport such as Auto Europe, Avis, Europcar, Budget, Hertz, Maggiore, Sixt, Thrifty Car Rental and Targa Rent. Rome Ciampino Airport was opened in 1916 and is one of the oldest airports in the world still in operation. It is a combined military and civilian airport. 4,788,931 passengers visited the airport in 2008. 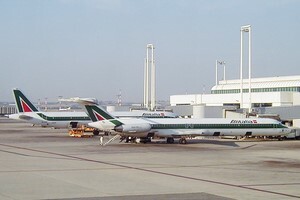 10 different airlines serve Rome Ciampino Airport, particularly low cost. The airport has a limited range of shops, but is tax free. There are several bars and cafes but no restaurant. In addition, the airport has banking and first-aid office. The new hotel Hotel Meeting is located 1 km from the airport.